Oh teaching…there never was a job more frustrating…or more fun. And some of the best stories come from middle and high school classrooms. 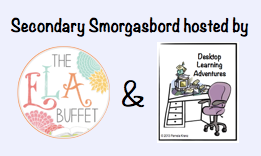 That's why several secondary bloggers are linking up this week to share some of our funniest classroom moments with you! Throughout the years that I've spent in the classroom, I have religiously kept a journal, a “Jenius Journal.” It is oh so full of “jenius” moments from my classroom. Tonight I will share a few entries that don’t quite qualify as genius, but they definitely make the “jenius” cut! 8. I accidentally told a group of 8th grade English students, as an example of hyperbole, “I’m so hungry, I could eat a whore.” Oops…meant to say horse. The class was lost for the rest of the block. 7. A student vomited all over his desk at 8:30 AM—I felt horrible for him, until I discovered he had had copious amounts of vodka and orange juice for breakfast. 6. A student asked, “Ms. Cleary, when will we ever use this in life?” while I was reviewing proper hand-washing techniques to prevent the spread of flu. 4. Over the years, students have laughed every time our vocabulary word has been “assassin,” “Shiite,” or “Hellenistic”—every. time. 3. I still can’t draw the U.S. Southeast on the board without it looking inappropriate. Giggles fly around the classroom. Never again, I always think. 2. One of my seniors came back from the restroom, after turning in two freshmen for throwing toilet paper all around the boys’ room. I was so proud of him because he had chastised them, saying, “You need to respect your school, man.” A while later one of the principals came to get him. The freshmen had retaliated by informing the administrator that my student had been in the boy’s room vaping. They got detention—my senior was suspended. And the number 1 “jenius” moment in my career thus far…. 1. A student at our rival high school got in-school-suspension. He emailed a bomb threat from his own account to get out of it—the school is pressing charges. 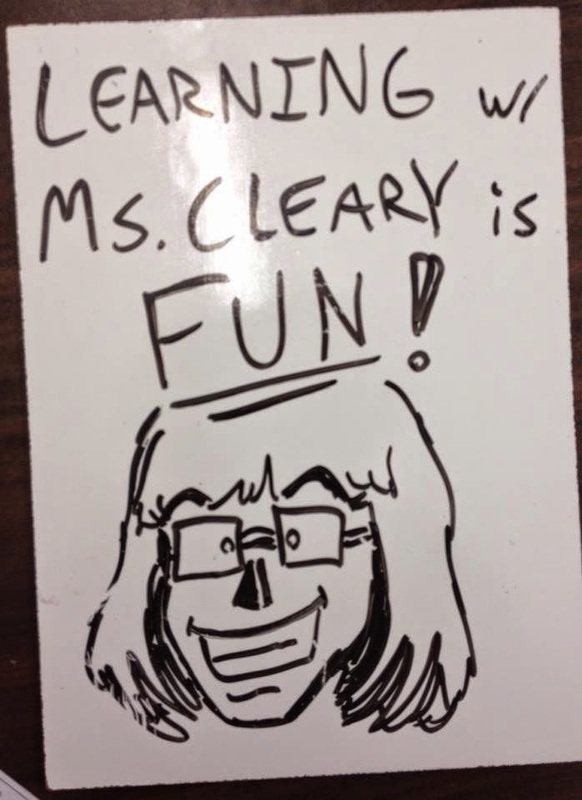 What are your funniest teaching moments? Leave a comment below to let me know! And don’t forget to check out the fantastically funny stories from the amazing teachers linked up here! 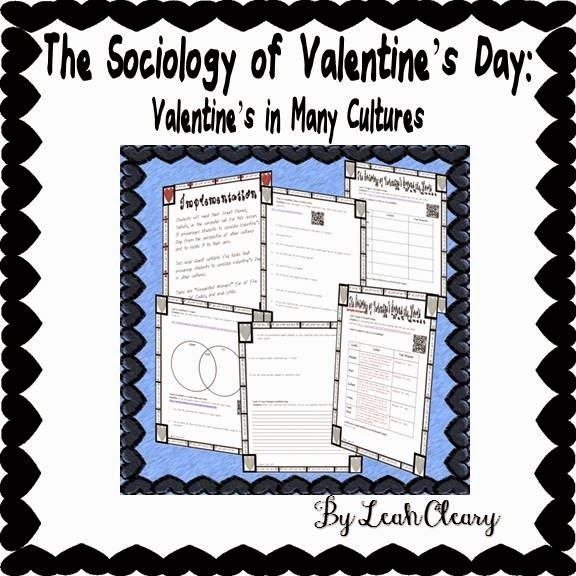 Every culture has different Valentine's traditions. Whether they call it Valentine's Day or not, most cultures devote at least one day a year to the celebration of love. In the U.S. and many western nations, we give cards, chocolates, flowers, and even jewelry to our sweethearts on February 14. In Japan and South Korea, women give expensive chocolates to their significant other. The men give the ladies gifts on March 14. In Malaysia, single women write their numbers on oranges and throw them into a river, hoping that their soul-mate will find it and call them. Usually, local merchants go fishing for these. They are considered good luck, and sell at top dollar. But the stories are the best. In the West we've forgotten them, but in China, they still tell the tale of Niulong, a mortal who fell in love with a fairy. Although they were forbidden by the jade emperor to be together, Niulong rode magic shoes to the heavens to be with his beloved. The jade empress created the milky way as a barrier between them, but her heart was softened by a flock of magpies that built a bridge for the lovers, and she allowed them to be together one day a year. The Chinese celebrate that day in August. They call it Qixi, and it is very similar to Valentine's Day. The story that Hallmark has made us forget in the West is the tale of St. Valentine. St. Valentine lived in the 3rd century A.D. under the Roman Empire. The emperor had outlawed marriage among young people because he believed that marriage made men weak soldiers. St. Valentine married many young couples in secret. He was eventually caught and sentenced to death. While in prison, St. Valentine allegedly prayed with the blind daughter of one of the guards, and her sight was restored. He wrote her a note that said, "From your Valentine." 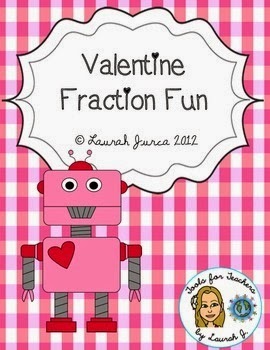 The first Valentine! This Valentine's Day, keep the stories alive with this web quest about Valentine's Day in different cultures--answer key included. 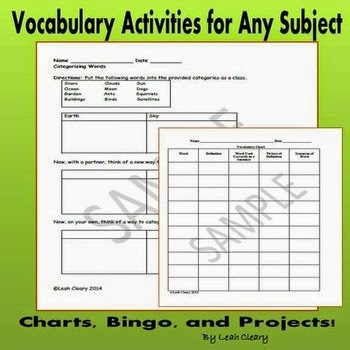 I use it in my sociology class, but it's also great for world history and other subjects. 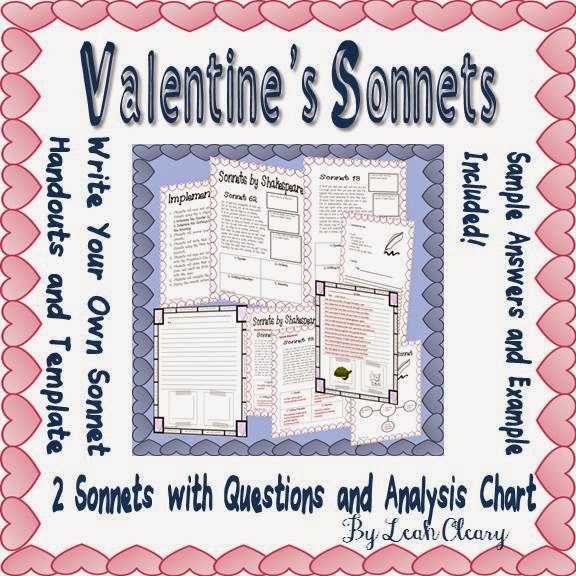 Or have your students analyze sonnets and write one. Why buy a card when you can write a sonnet? There are answer keys and even a sample original sonnet. And here is my Valentine's Day gift to you...free Valentine's borders. Use them commercially or personally. What's your favorite Valentine's Day story? Leave a comment below to let me know. Today was...Monday... and like many teachers (and students) out there, I hit snooze more than once. I rolled into work with an extra-large, extra-strong cup of coffee. I didn't have my glasses--I broke them on Friday, so I was kind of disoriented. Fortunately for others on the road, I'm far-sighted. I had a mile-long to-do list for my planning block, but when I sat down at my computer, my Outlook calendar reminded me (very rudely, I might add) that this was the day two particularly tedious administrative tasks were due, and it's me, so I hadn't begun either yet. Right away, I realized I would be taking home copious amounts of work, and I had to get my son to wrestling practice in the evening. And I thought I was caught-up on Friday....When will I learn? Oh--and the heater busted in one of the older buildings at my school, so another class met in my room on my planning, making my computer unavailable to me. The highlight of that? It was my best work friend's class, so I had actual adult conversation this morning (a huge plus to all teachers out there). The down-side? I got oh so little done. Then my phone rang, and it was the nurse from my son's school. Fever, wheezing, poor kid, but all I could think was, "I don't have time to prep for a sub." Husband to the rescue! He picked the kid up and got him to the doctor. Oh, my, but that kid is sick! And my students today--I've rarely seen such lethargy interspersed with bouts of uncontrollable gregariousness. They went from zero to 500 and back to zero again several times over the course of each block. And what did we learn? Please don't ask them (or me, for that matter). We were supposed to use the IPADS for a QR search activity, and guess what? If you teach, you probably can....The WIFI was out! Today was a classic Monday. A classic off-day, and I'm glad it's over. I could do something else. I loved being a barista, and I had benefits and zero stress. I never took work home. (Of course, I didn't get the summers off :)). Well, I needed a reminder today, and I got one. 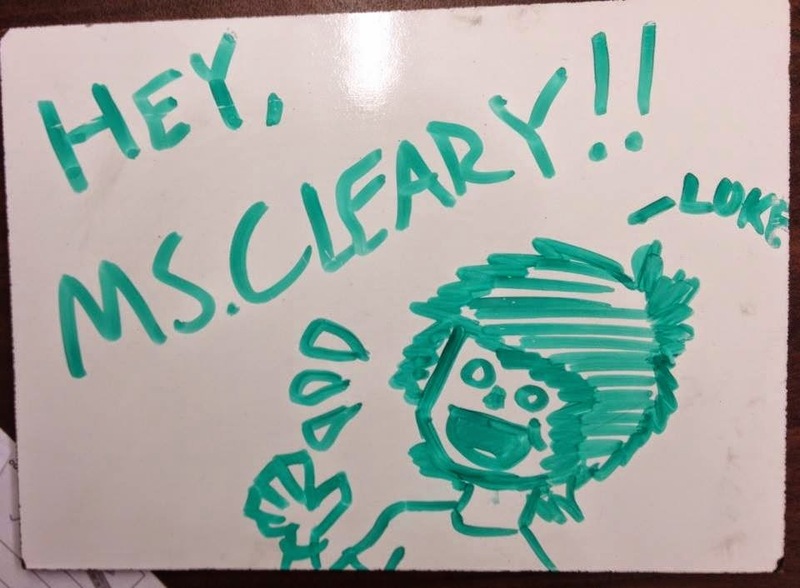 A former student of mine, who was in the class that usurped my planning block, left me messages on the mini whiteboards that I keep at all the tables. 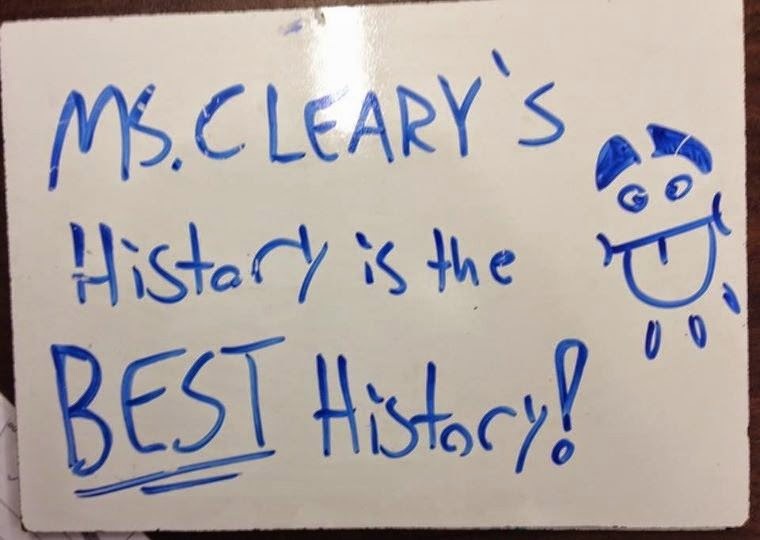 Thanks, Former Student! I didn't think I looked like Velma from Scooby Doo, but I'll take it! Enjoy the rest of your week, be productive, and take it easy when you can! See you next Monday--hopefully it's a better one! 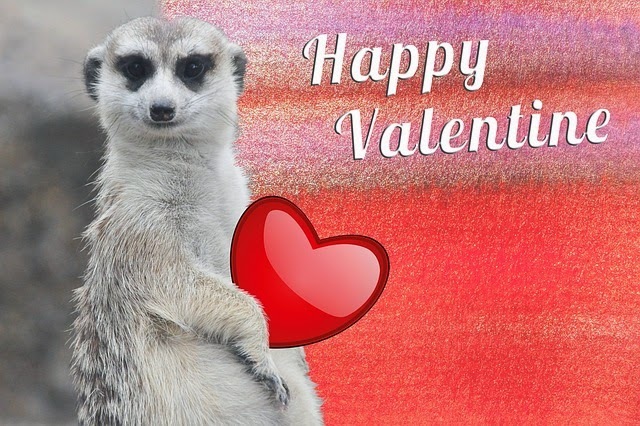 Love is in the Blogosphere this Valentine's Day!